Plenty of popcorn films have a political agenda, but can they win Oscars? Because Hidden Figures really is a popcorn film. It's frothy and polished, its characters and sets bathed in a sunny glow that'll leave you feeling all warm and fuzzy inside when it's finished. It's a period piece about one of America's greatest triumphs - the Space Race, specifically the mission of John Glenn and the Friendship 7. 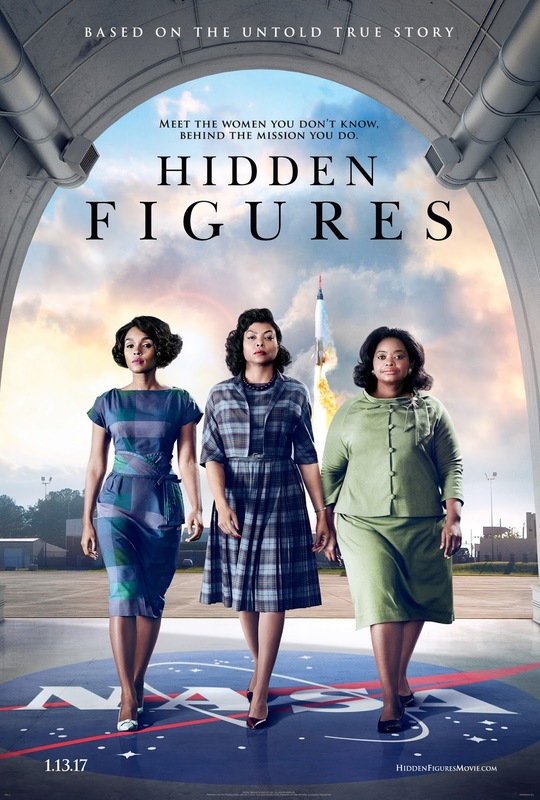 It follows three women proving their worth to NASA as mathematicians, rising to positions of prominence in calculations, engineering and coding. It's about underdogs overcoming adversity; the power of the human mind versus machines; the importance of study and knowledge in forward thinking. It's a celebration not of the brave male astronauts who were the face of space travel, but the female minds behind them who showed their own kind of bravery. It's script is full of amusement, largely from its three sassy, wise-cracking female leads. A jovial soul soundtrack accompanies moments of lightheartedness. And it's denouement is predictable yet sweet, tying up each loose end with every character receiving the positive recognition they deserve. There's no doubt it'll have you punching the air with glee by its conclusion. Yet there's more to Hidden Figures than just female empowerment. Those women? They're African-American. In the domestic world, they are each pillars of their community. Family women, successful women, religious women. Even at work they speak out of turn only when absolutely necessary. Yet it is absolutely necessary. All three women are repeatedly met with adversity for their gender and their race, yet they take it all with a polite, graceful smile before showing those men who's boss. The film doesn't sugarcoat the treatment of black people in the 60s, but with such likeable protagonists we can't help but smile with glee at their eventual triumph. That's also testament to the strong performances from Taraji P Henson, Octavia Spencer and Janelle Monae who together make the film such a joy to watch and far more than just an Oscar box-ticking exercise. The film is based on true events that deserve to be told regardless, but seeing three black women in positions of power at the helm of an Oscar nominated film in today's turbulent America is a strong political statement. Frothy and enjoyable as it is, Hidden Figures simultaneously delivers a hard-hitting and much needed message of equality and diversity. Watch: Hidden Figures is out now.